Battery I, 4th U.S. is ordered to leave Van Derveer and head toward the Snodgrass house, where General Negley is forming an artillery reserve. The infantry of the brigade continue toward Kelly field. Van Cleve, unable to find a place on the front line for his division, moves it north behind Brannan. The 100th Illinois stumbles upon the main Confederate line and is driven back with heavy losses. 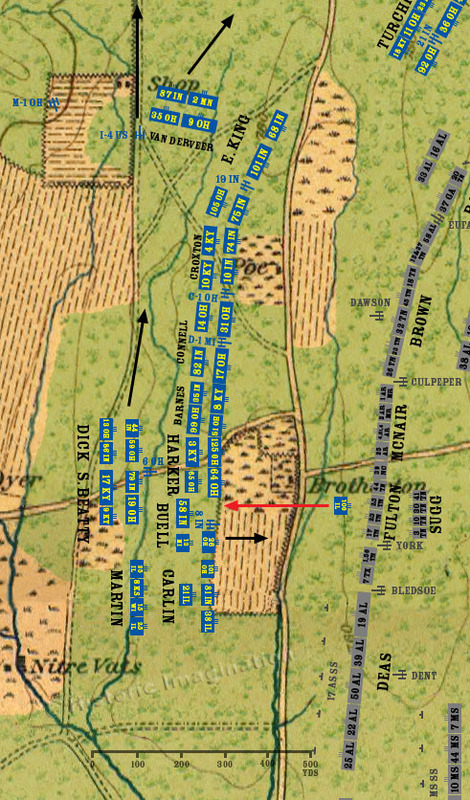 Upon learning of the 100th’s advance, a surprised Colonel Buell sends the 26th Ohio forward to cover the regiments withdrawal.